The Silver Jubilee was performed on 3Feb. 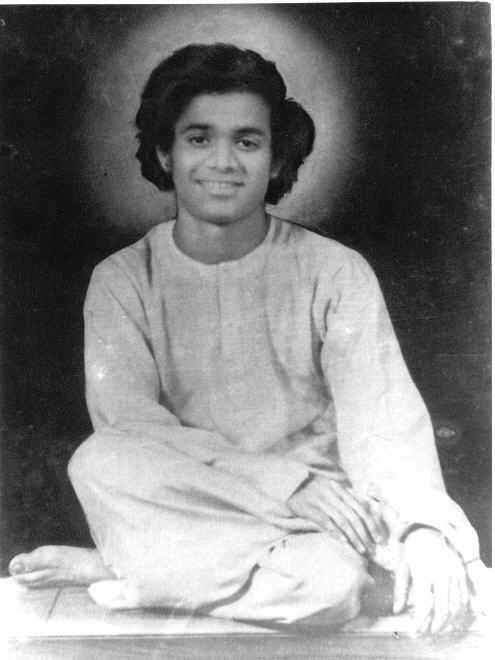 1973 by Bhagawan. Swami gave permission to construct a Stupi (Pillar) and selected a spot. V Sethuraman, Director, WS Insulators said Bhagawan had directed him to help me with engineers. Soon they were at the job and 32 feet Stupi in concrete was erected in less than a fortnight. The struture is in the form of a lamp with a crown of lotus flower. The base is four sided and each side has a Deity. The lamp is the insignia in the Prasanthi flag. The first face on the lower part is presided by Lord Vigneshwara. Divine Message "Sathya is My Prachar" (Preaching) is engraved below. On the second face is OM and Lord Subramanya. The inscription is "Dharma is My Achar" (Practice). On the third face is Sri Dakshina Moorthi (Shiva as Guru), with the words, "Shanthi is My Swabhava" (Nature). This is the primary side with the declaration, "Silver Jubilee Stupi blessed by Lord Sri Sathya Sai Baba - 3-2-1973. On the fourth face is Lord Venugopal and the inscription "Prema is My Swarupa" (Form). In the discourse on 3 FEb. 1973, Babaji said that Stupas like this would soon be erected in some of His Mahima Sthalas. He unveiled the 'Sarva Dharma Aikya Stupi' at PN on 23 Nov. 1975. Babaji has selected this as the insignia of the SSS Institute of Higher Learning. There is a third variety of the stupi at Dharmakshetra, Bombay. These are like the Ashoka Pillars and hail the Sai Era. Dr. V K Gokak gave a speech at the Mandir on 3 Feb. 1973, " ..... This the first of its kind of all Stupis to be raised in future all over the world. .... The Stupi represents the problems suffered by the devotees here and how courageously they had emerged victoriously. .... On the Stupi are inscribed the great teachings of our Lord. ...."
The Navagrahas were installed by Babaji on 25Jan. 85. He materialised Navagraha Chakra witht their figures inscribed and along with nine gems kept in the pit of Lord Surya (Sun) and installed the Sun God. He is the principal Deity of the Navagrahas. 1943 to 1953 almost every devotee used to wash the Divine Lotus Feet of Lord Sri Sathya Sai with rose water and take it for all diseases. Pada Pujas could be performed any time, from early morning to night. We used to apply Sandal paste, turmeric, oil and take foot prints on pieces of cloth, frame it and worship. Once it happened that one foot was larger than the other in the foot print. Swami said it was Shiva's and Shakthi's. 3Feb. 1949, after the installation at the Guindy Mandir, Babaji returned to our residence for Lunch. He ordered us to spread a cloth and stood up on that. There was a large foot print, double the size of His Feet. He smeared Sandal paste on it and said it was the foot print of Shirdi Sai. It is adorning the walls even now in the shrine at Guindy. Dr.Nithyanandan kept the silver padukas of Lord Sathya Sai in front of the framed picture of the Shirdi Sai's divine feet. 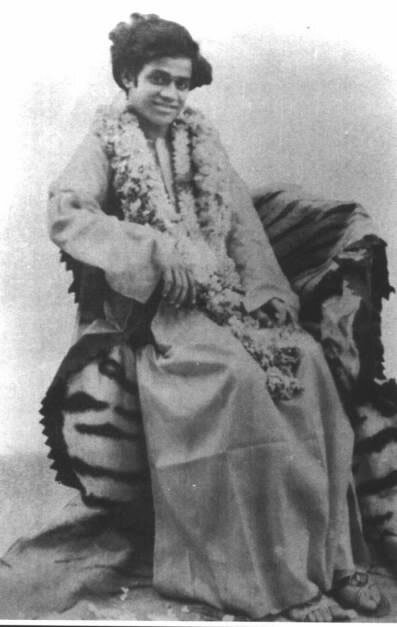 He took a a photo which showed foot print impressions on Siver Padukas as though Swami had just worn and left. (The photo is in the book). Sri Chakra is considered as the subtle form of Devi. The worship of Sri Chakra gives spiritual knowledge and at material level, prosperity and health. It gives Divine Energy to progress in Sadhana. Our Bhagawan creates Sri Chakra before installing idols in temples. During Ashtabandhanam ceremonies at Guindy Mandir, Swami had manifested and placed three types of Chakras during three Ashtabandhanams. Sri Chakra of Lord Vishnu is called Sudharshana Chakra. It is the discuss that Lord Vishnu carries always to destroy enemies. The Chakra destroys all varieties of enemies, human or non-human or in the form of diseases or bad thoughts, bad words and bad deeds. Swami manifested Sudharshana Chakra and kept below the idol at the Guindy Mandir during the Ashtabandhanam on 20Jan. 84. It had the Chakra on one side, and Lord Sathya Sai's Form on the other side. He said it would enable devotees, free of their enemies, internal and external. Purushothama Naidu had lost his eldest son, in a car accident, in 1976. His wife fled to Tirumala to see Lord Venkateshwara and returned in a deranged condition. She was kept in a separate room. Naidu is a great devotee who regularly chanted Sudharshana Mantra at the Guindy temple. One day his wife said, "Why are you bringing the Chakra from the Guindy Mandir and sending it on me?" Gradually she returned to normal. Such is the power of Sudharshana Chakra and its Manthra. Eight years after the tragedy, she was revived. Regular worship protects us from great dangers, relieves us from incurable diseases and confers success in all our endeavours by removing all obstacles. I offer prayers to Lord Sudarshana who is none other than Krishna, Govinda, Gopijana Vallaba, and who is supreme and Parama Purusha. He who is circled by fire, agitating or cleansing all directions, save me from others' bad actions, such as Manthra Prayoga, poison, weapons directed by ill will. Sudarshana is ugra (harsh) towards enemies and kind to you and saves from all perils, if prayed to Him. - 19th Anniversary Message from Swami - 3Feb. 1967. - 20th Anniversary Message from Swami - 3Feb. 1968. This Brahma Gnani having eight lettered name as Sri Sathya Narayana is world famous. He has the unique power of manifesting and being at one time in various parts of the world. By His mere Divine Will many diseases disappear, misunderstandings in families cleared, and spiritual knowledge conferred on Sadhakas. This temple is established and governed by the Loka Rakshaka, Sri Sai Baba. This Devalayam (Temple) is very famous and lots of devotees get their desires fulfilled. There are also persons who wish to destroy its glory and they will in due course be totally destroyed. In this temple Truth is established forever. It vibrates Peace all around. 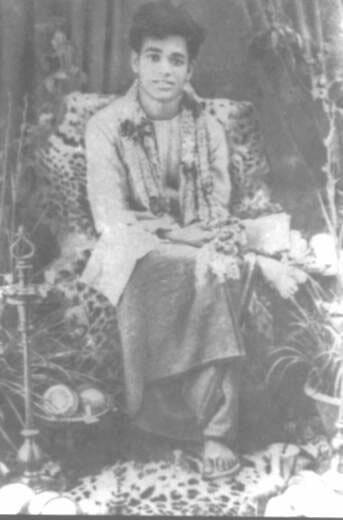 Sareeri Krishna Paramesunamsa - Maha Brahmajyothi Swaha". One rainy day in Madras, lights went off at 8PM. I had some tenants who had plotted to harm me. I heard one person abusing me. Suddenly it flashed in my mind the lines of Adi Shankara, "Na mae Mrithyu ...." (Death cannot claim me nor fear ...). Frequency of abuses increased. He rushed with a stick and raised above my head. "Stop it; what are you trying to do to my daughter? ", I heard the voice of my father. he was sent to save me in time. From 1949, he lived in the Guindy Mandir like a priest. I was taken aback when I saw him. He said that the idol spoke to him "Rush to your house - the life of your daughter is in danger". He rushed in a taxi. No doubt, the idols in temples vibrate with life to save devotees. Hence we adore Him "Sri Sai Athiprema Pradharshakaya Namah". Bhagawan always says, "Why fear when I am Near". Colonel Iyer was an alcohol addict for 36 years and a chain smoker. he never knew the alphabets of his religion. One day he had an intense urge to enter the Guindy temple. He looked at Sai and the picture. Out came a voice, "Stop it - stop it'. At once he dropped the habit of smoking and drinking and since then, Bhagawan is giving him lessons directly on spirituality. Great tenets of Vedanta are revealed without any sadhana. He is the chosen disciple.